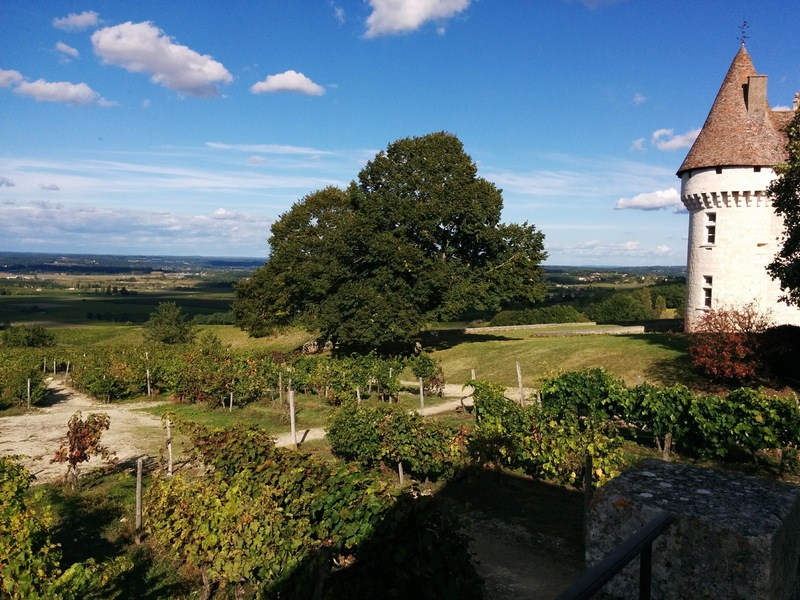 Castles and vineyards: from the Garonne to the Rhône. On Sunday, the 17th of September, we watched the rain slide off the windows of the train as we sped west towards Bordeaux. Whilst the train carried us more or less down the Garonne River, the rain stopped, though the clouds remained. We spent the night in the HI Hostel near the Gare Saint-Jean in Bordeaux. A note about using HI (Hostelling International) hostels in France. They belong to the HI-associated organization Fédération Unie des Auberges de la Jeunesse (FUAJ), and they don’t often appear on the large hostelling websites, including the international search of HI-USA. Instead, one must go to the FUAJ website, http://www.hifrance.org/, where one can search all the towns with an HI hostel and book a stay. The FUAJ has high standards, so we enjoyed staying in their facilities whenever possible. They recognize the membership cards of other HI associations, including ours from Canada and the USA. 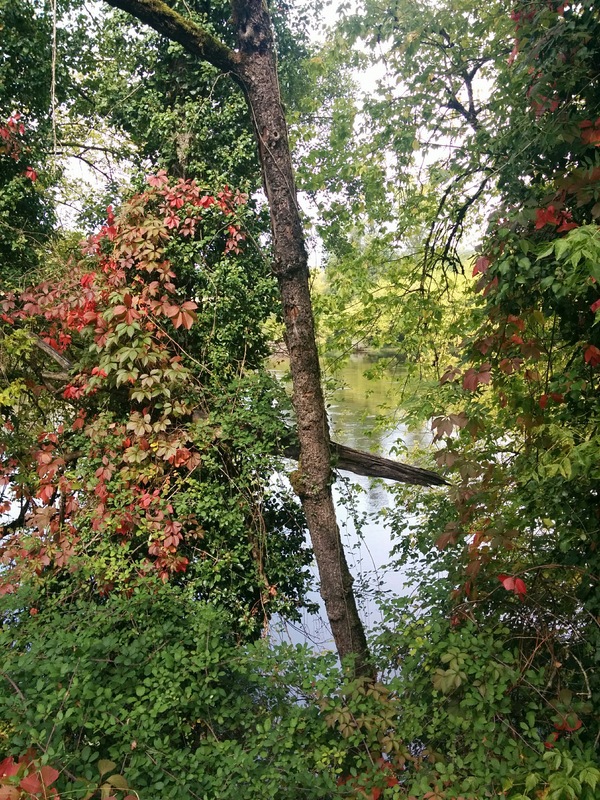 On Monday, we crossed the Garonne River, and made our way toward the Roger Labépie bikeway, which connects Bordeaux with the town of Sauveterre-de-Guyennesome, 60 km inland. 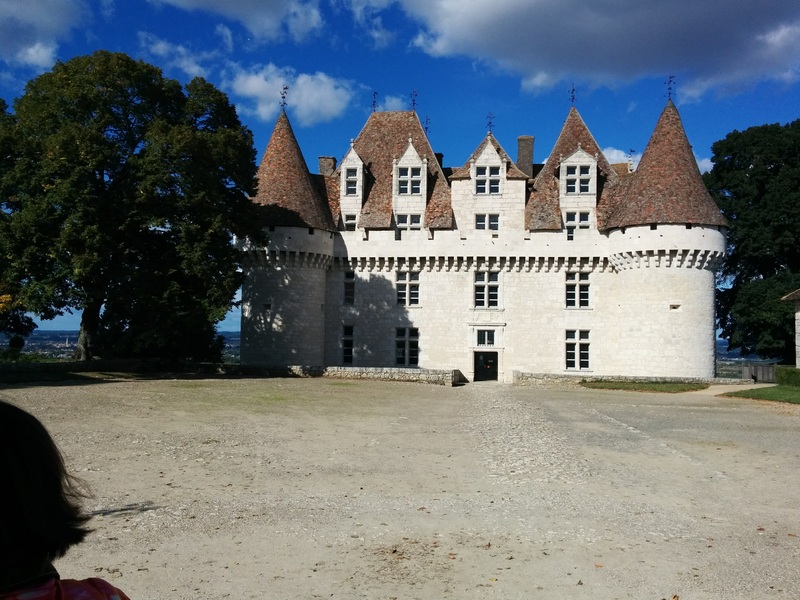 We had to negotiate some construction across from Bordeaux, but once we reached Latrense, we picked up the bikepath through the woods and around the towns. Another rail-to-trail project and a pleasure to ride. 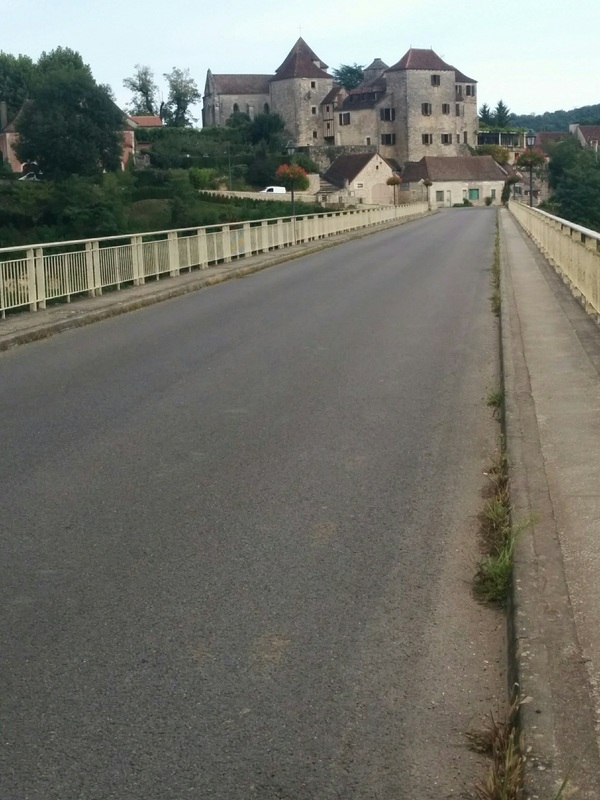 We left the bikeway on the D122, and crossed the Dordogne River at Branne. I got ahead of Cheryl at that point, because my OSMand map took me on some backroads off the main road in a straight line. Consequently, I reached Saint-Emilion before she. 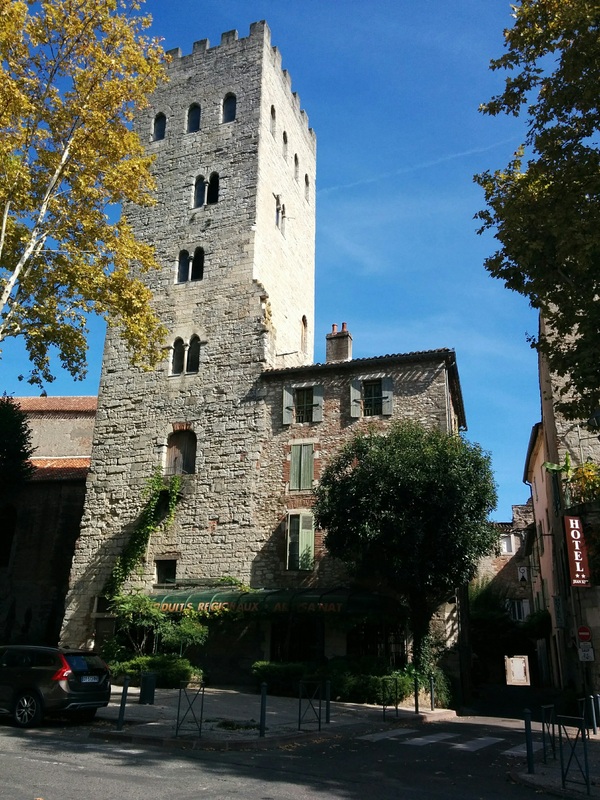 I waited in the historic center, so we could check into the Logis des Remparts hotel together. The overcast had given way to sunshine, and there was plenty of it left. We walked up to the town hall, which had a pleasant park. Sitting down on the steps in the garden, we ate our lunch, watching the tourists going by on the cobblestone main street. 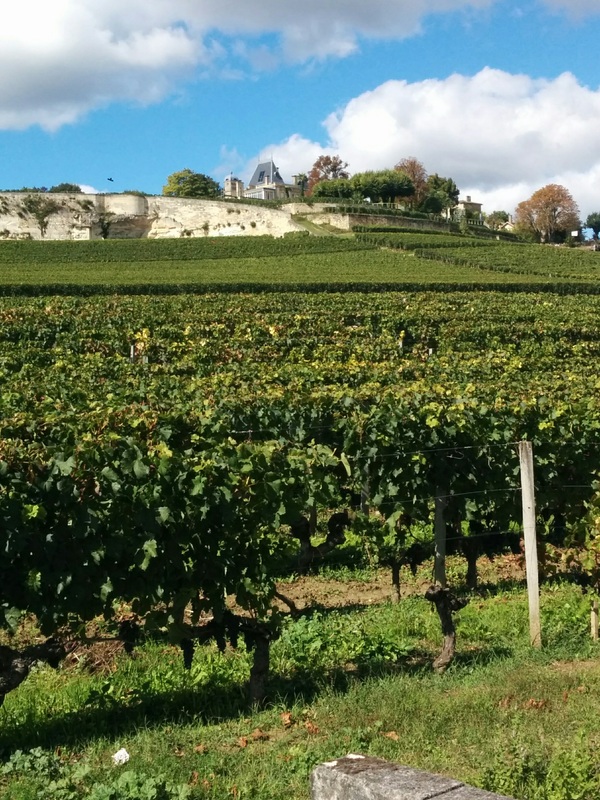 Saint-Emilion is a UNESCO World Heritage Site, charming to wander and admire. 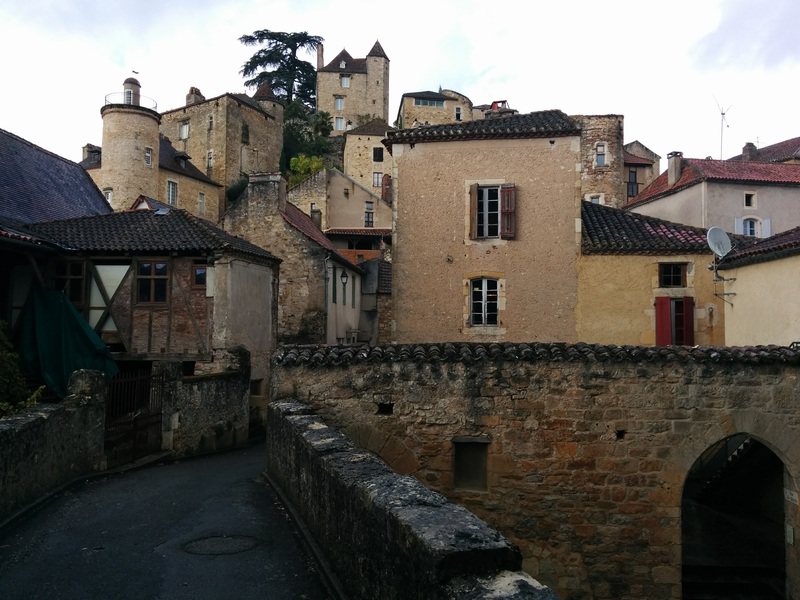 It lacks the sprawling modern suburbs of other medieval towns, because the vineyards press up to the historic village. 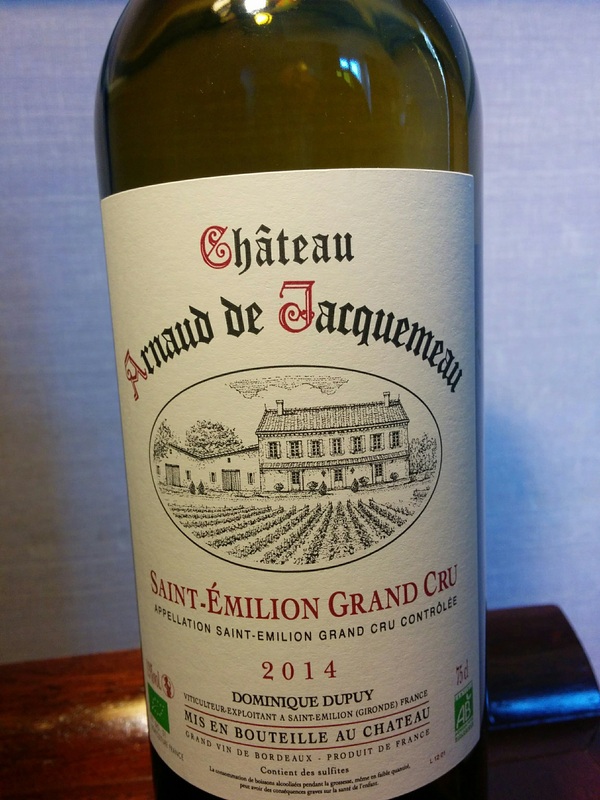 Tuesday morning, the sun felt good as we climbed to the top of Saint-Emilion and turned west across the fabled vineyards of some of France’s most famous appellations. 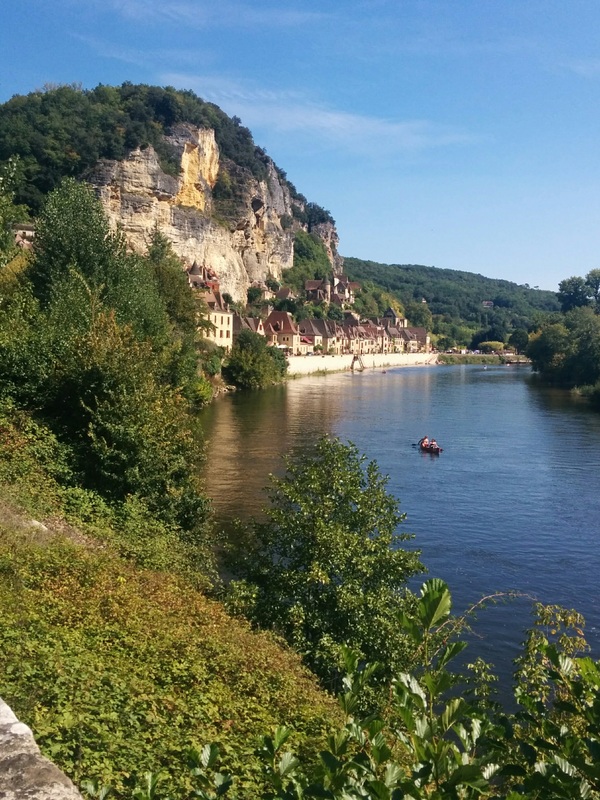 At Castillion, we left the Gironde Department and crossed into the Dordogne Department, named for the great river that runs through it. 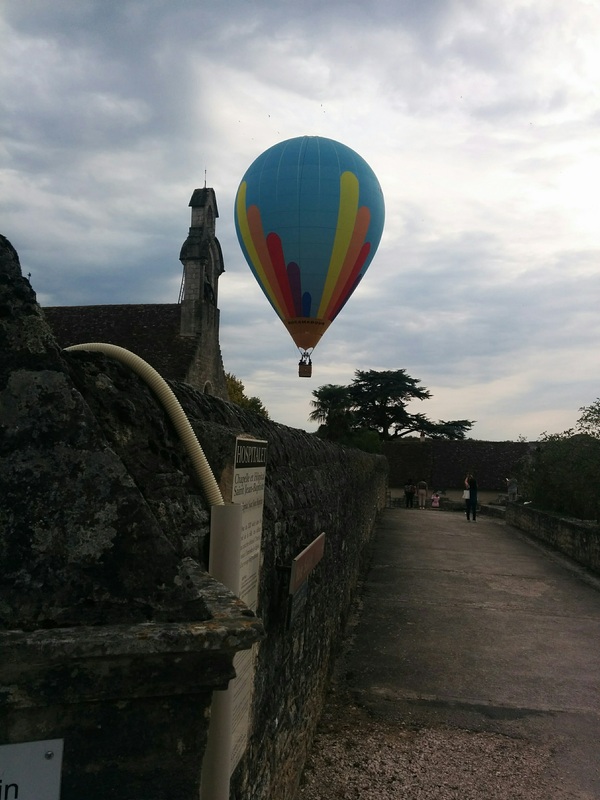 In general, we followed the Dordogne River upstream, all the way to the castle at Monbazillac. This estate not only provided a beautiful view of the River Valley but also much information about wine, grapes, and the history of the estate and the surrounding area. This was part of Protestant France during and after the Wars of Religion (1562–1598), also known as the Huguenot wars. 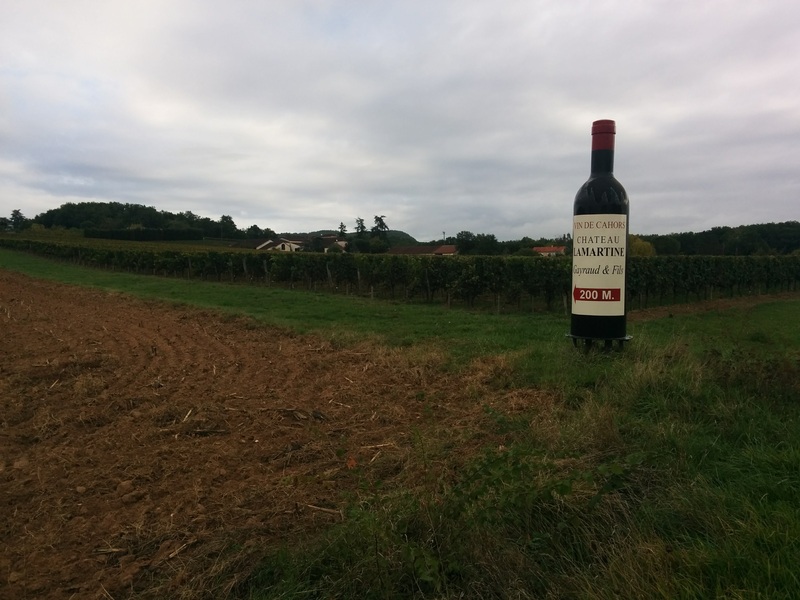 From Monbazillac, we made our way downhill to the city of Bergerac, and checked into the La Flambée hotel. Set in an old manor, the hotel featured its own restaurant and put us conveniently on the road the next day. 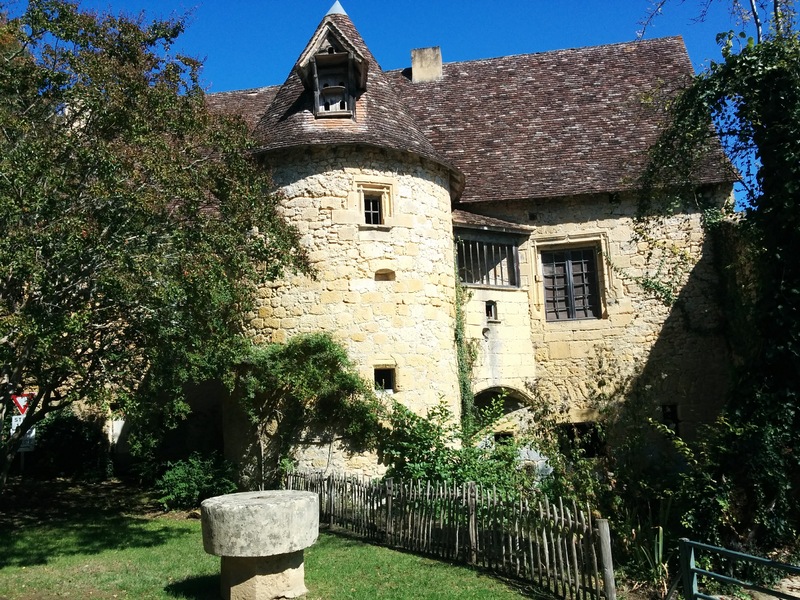 On Wednesday the 20th, we rode along the Dordogne River, stopping for lunch at a medieval paper mill that is still in operation. Rolling on little-travelled back roads, and long stretches that were closed for road work (which we could ride past), we enjoyed light traffic as we climbed rolling hills and blew down empty back roads. 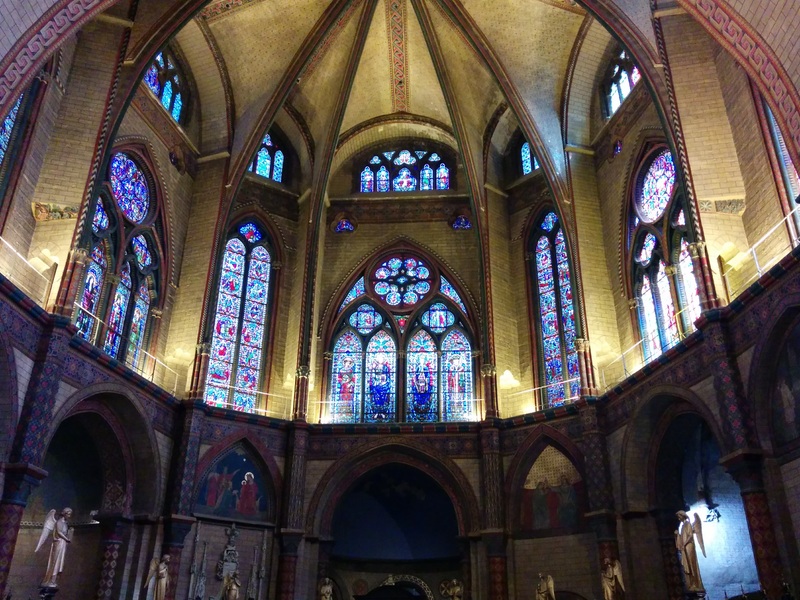 The Abbey of Caudoin was an important stop on the Way of Saint James, in part because a relic said to be part of the Holy Shroud was kept there. 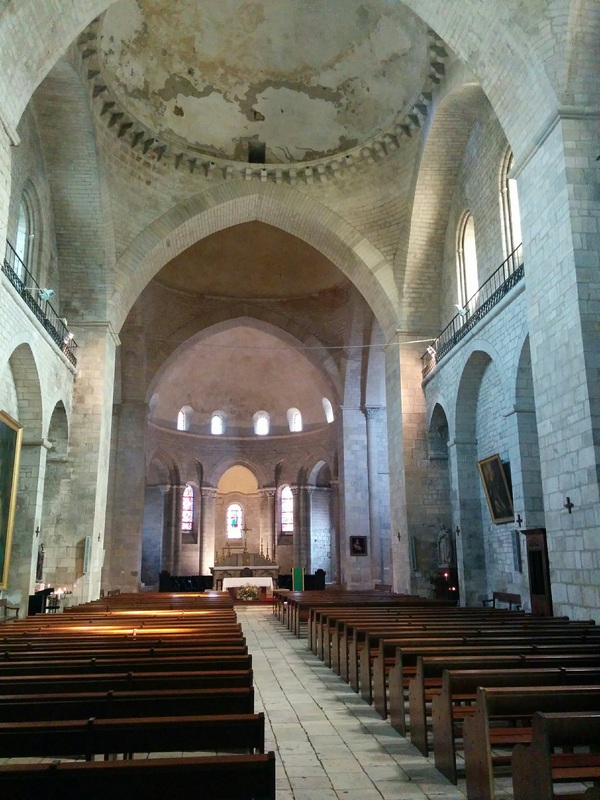 The Abbey was built in 1215, and became a Cistercian abbey in 1219. Some of the famous pilgrims who stopped by included Richard the Lion-Hearted and Eleanor of Aquitaine. In modern times, the shroud was determined to be of Egyptian cotton woven in the 11th Century, but that did not take away from the beauty of this World Heritage Site. 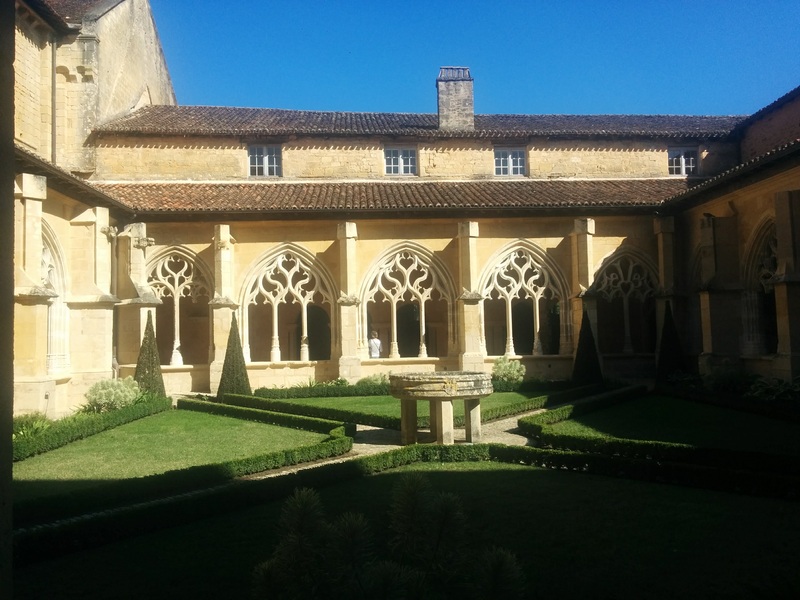 We found an HI Hostel in the exceptional 15th-century cloister, but had already made reservations in Saint-Cyprien. 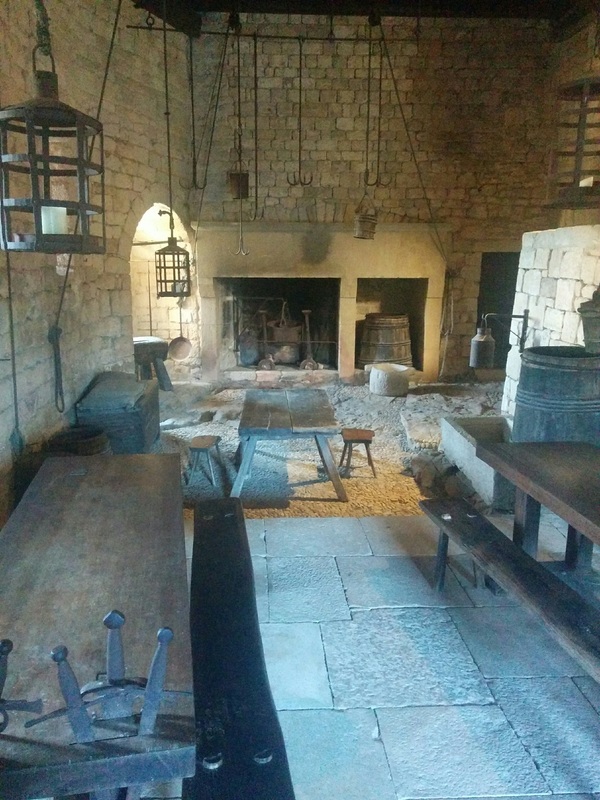 Too bad; it would have been cool to spend the night in a medieval monk’s cell. The Hotel La Gravette in Saint-Cyprien lay at the end of a long, steady pull up from the valley where the Abbey was located. It also had a restaurant, so we were in for a rest without complications. The next morning, we rolled downhill, stopping at a supermarket for provisions. 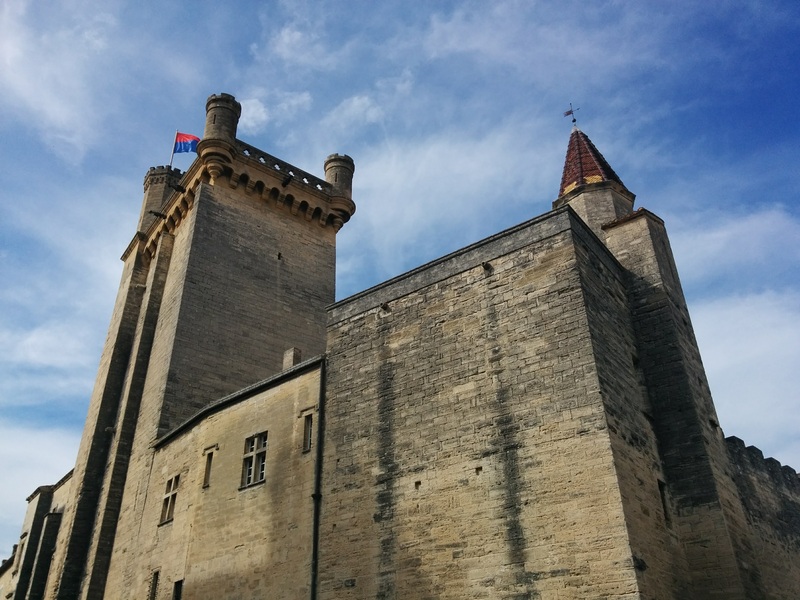 This was not a long day, because we stopped at the remarkable castle of Beynac for a few hours. This was one of the best-preserved castles that I have ever visited, with interior furnishings and details I rarely saw elsewhere. 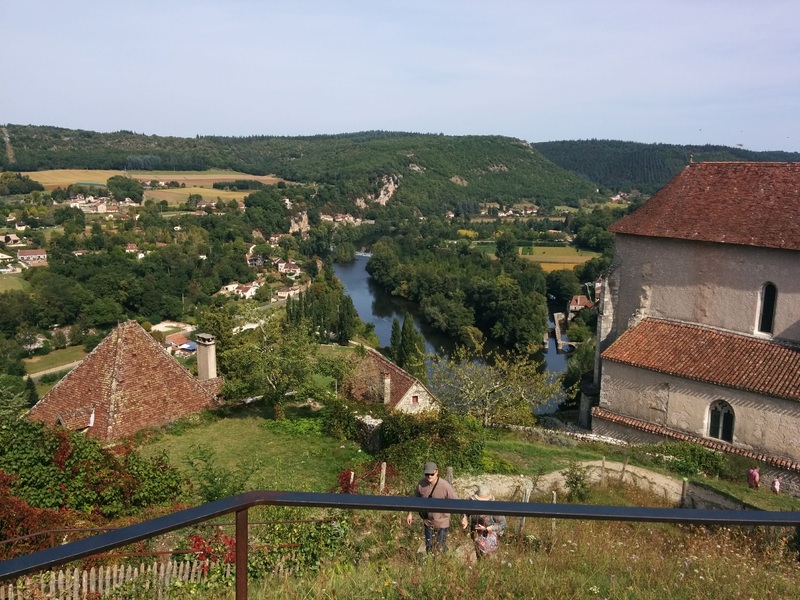 The view of the Dordogne Valley alone was worth the tough hike to the castle through the medieval town. 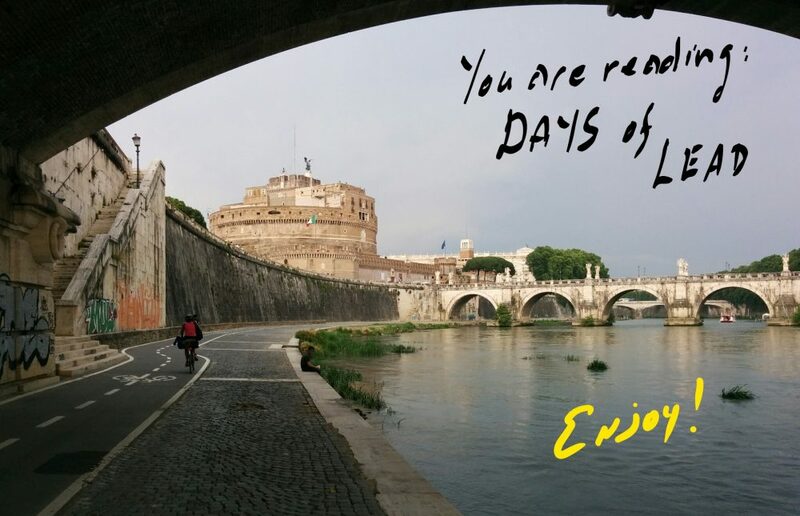 We stopped often to photograph sun-streaked villages along the river or vineyards recently harvested. 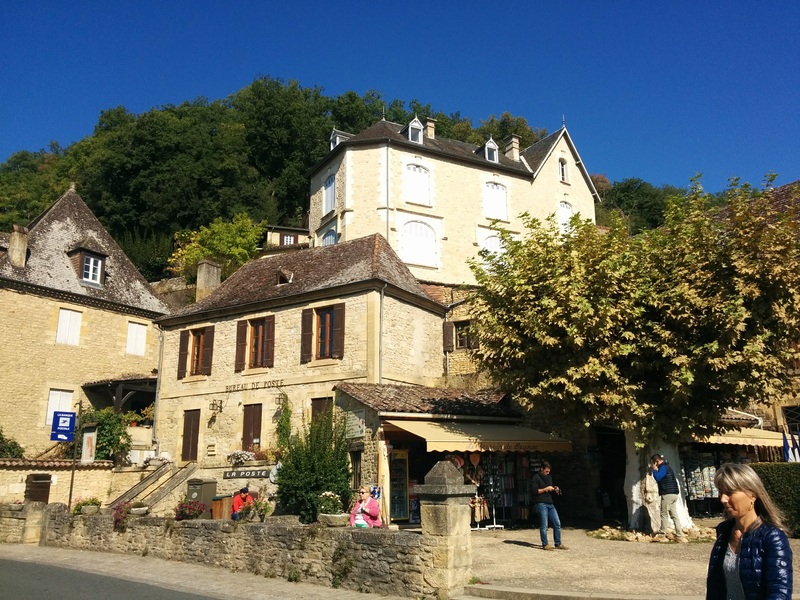 The Hotel Le Coulverine in Sarlat-le-Caneda was a well-equipped facility and easy to find. We arrived in plenty of time to visit the historic center. 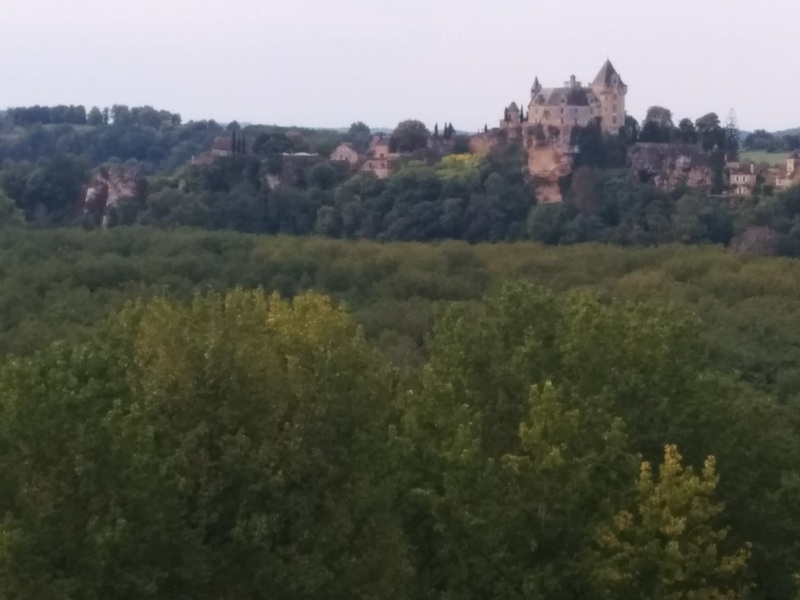 On the first day of autumn, we rolled downhill back to the Dordogne River, stopping at the castle of Montfort, another classic Disney-looking chateau. 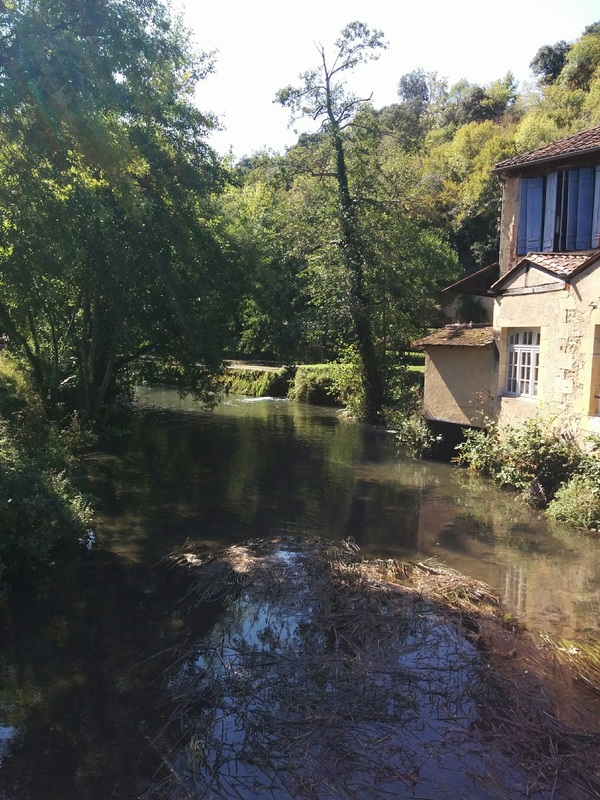 Then we followed the river upstream, leaving the Department of Dordogne, and returning to the Department of Lot. 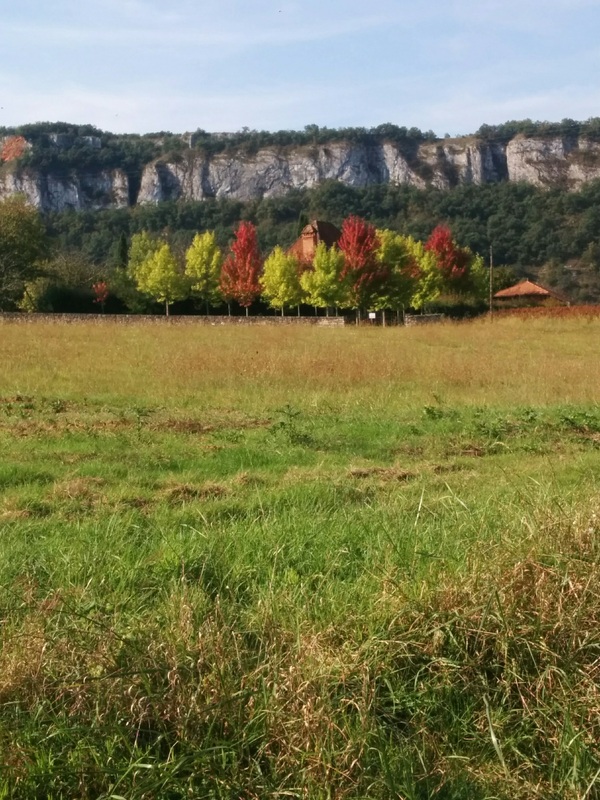 We were back in Occitanie, where autumn greeted us right on the border, with brilliant reds appearing in the bushes and trees by the side of the road. 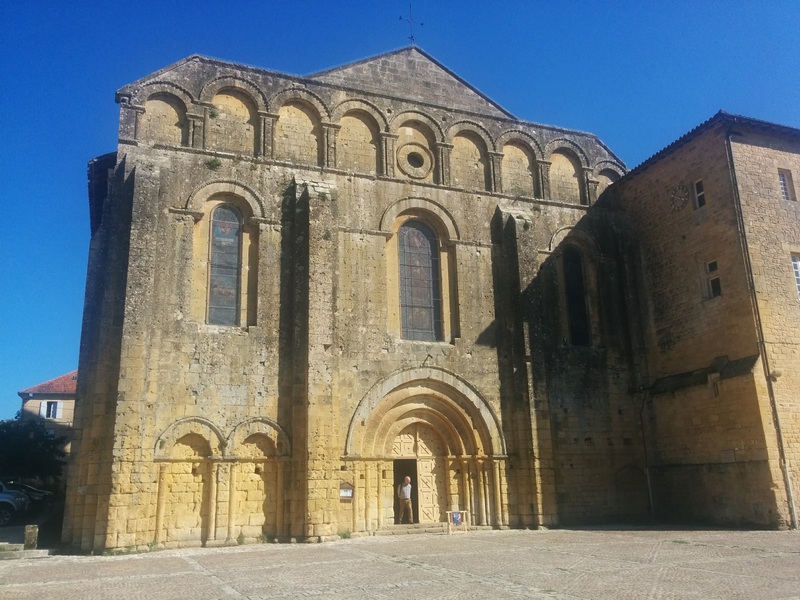 The Romanesque Abbey of Sainte-Marie at Souillac rated one-star in the Michelin Guide, but it was worth a stop. At the tourist office, we met a young man behind the counter who may well have been a cyclist. Looking at our heavy rigs, he suggested a route northeast out of town that would help us get to our next destination a little more easily, and without traffic. The road climbed torturously, but I knew from the terrain feature on Google Maps that the alternatives were worse. After crossing the A-20 motorway on a high bridge, we made our way across a rolling plateau and down a steep hill to the town of Saint-Sozy. There, we crossed of the Dordogne River for the last time. 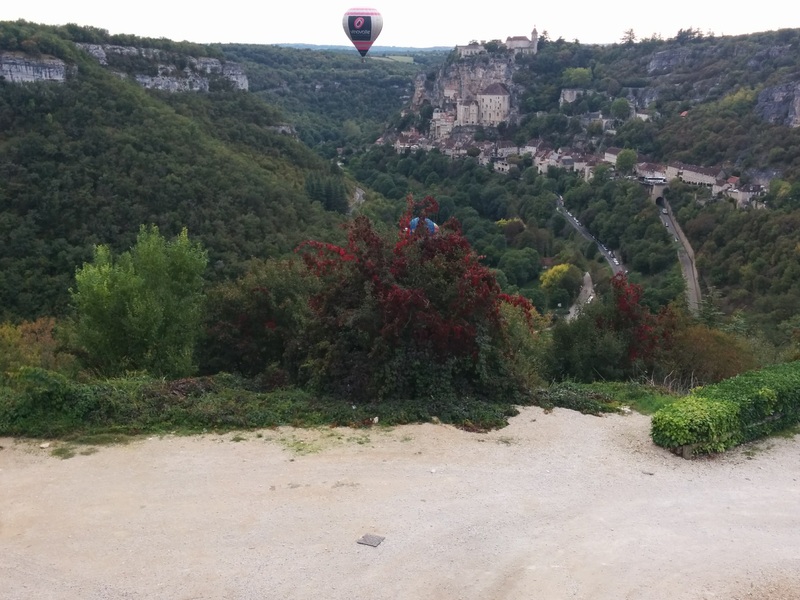 Cheryl wanted me to see the cliff town of Rocamadour. Shortly after crossing the river, we asked some men working on a house renovation project about the best way to get there. They told us that what looked like the easy way to the main highway at Montvalent was actually rough and steep. We decided to take the D-15, which looked like a long, steep climb, but which turned out to be relatively gradual and quite tolerable. 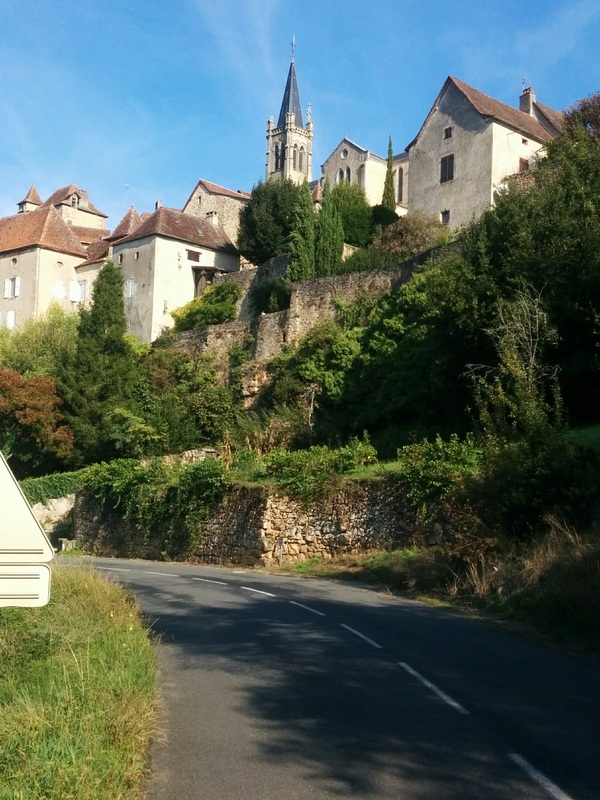 We arrived in Rocamadour in the late afternoon. It was indeed amazing, built into the cliffs overlooking the Alzou River. Some hot-air balloons were just launching as we watched. It was getting late, and the local scene was obviously crowded, with no lodging available, so we rode to the train station after stopping at a grocery store. 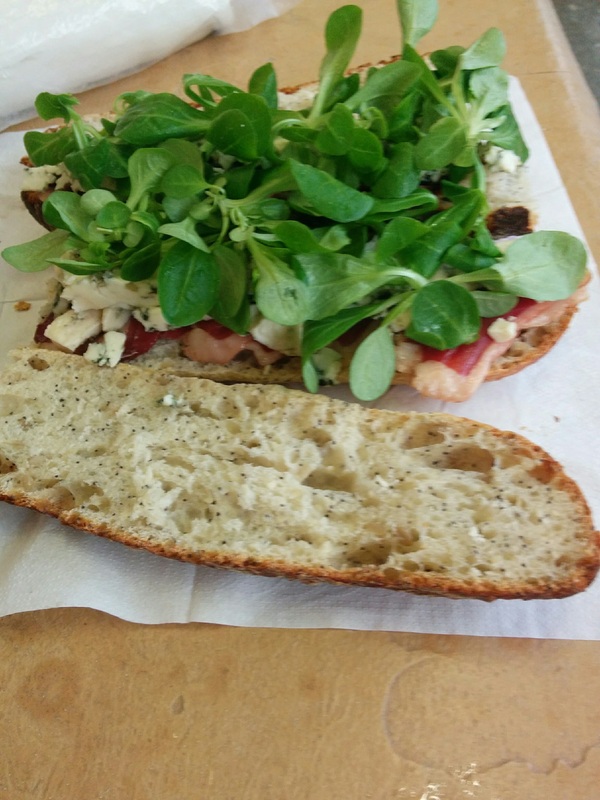 We had a delicious late lunch on the bench at the station, waiting for the train to Figeac. We found lodging in a chamber-d’hôte, which turned out to be a hostel also. The managers would not let us bring our panniers up to our room, which created a great inconvenience to us, and multiple, painful stair climbs for me. At least the bikes were locked safely inside the gate at night. The 23rd, Cheryl rode ahead of me to take pictures in the market. I caught up, and we rode back to the Cele River. We stopped at the bike store near the hostel to have her brakes checked, then made our way up out of town. 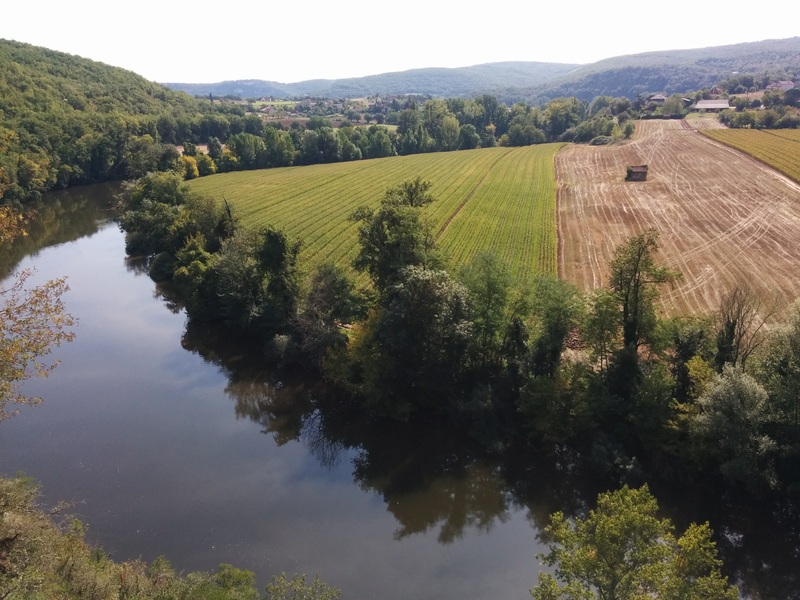 We climbed over the ridge and down to the Lot River, the border between the Lot and Aveyron Departments, which we had left after riding the Gorges of the Tarn and Lot Rivers the week before. The sun shone in a cloudless sky, but the air was pleasantly mild. The scenery was remarkable, even compared to what we had already seen. The ride downstream followed an old railway. it was fast and smooth. A steep climb on the other side of the river took us to Saint-Cirq-la-Popie (another Michelin-recommended attraction), where we admired the view and the medieval church. 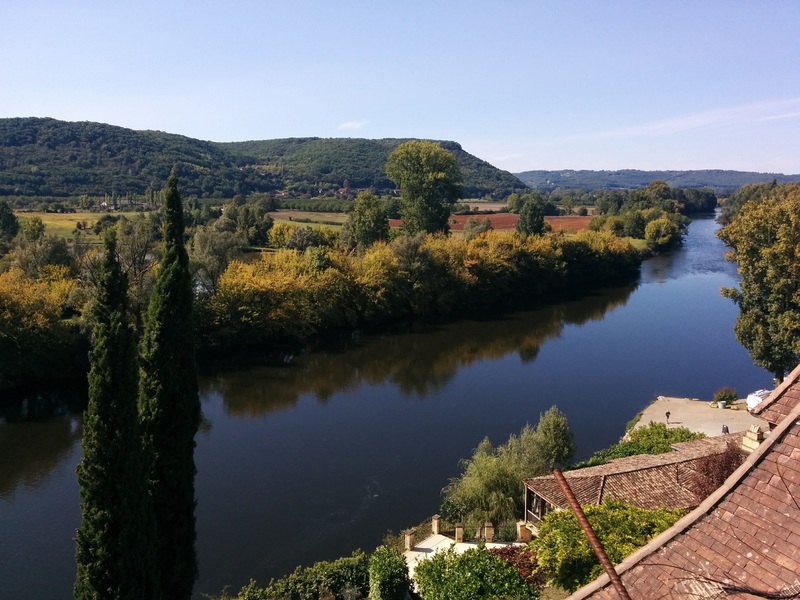 We decided to press on to Cahors, the capital of the department, where we booked two nights in the HI hostel, a brand-new facility on the Lot River. It was the weekend, so we planned to stay put. 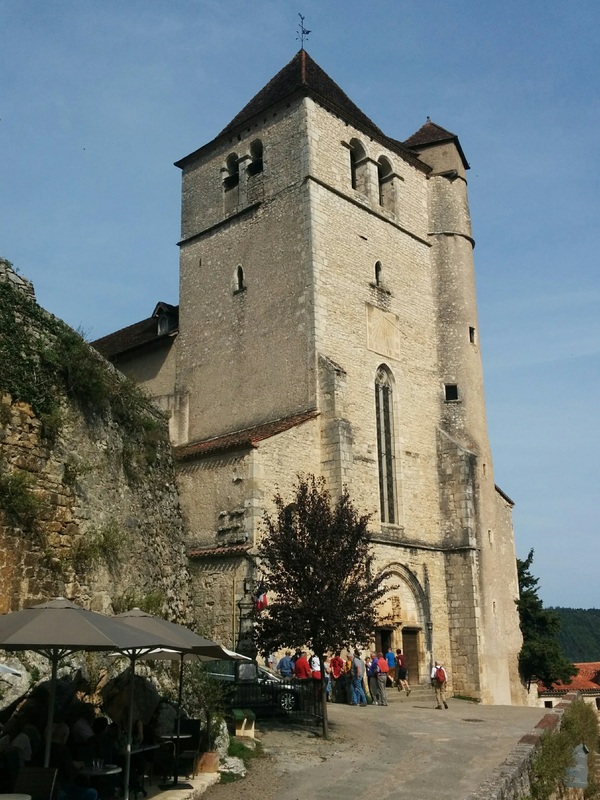 Armed with a tourist office map, we used our bikes on Sunday to visit all 18 recommended sights in Cahors. 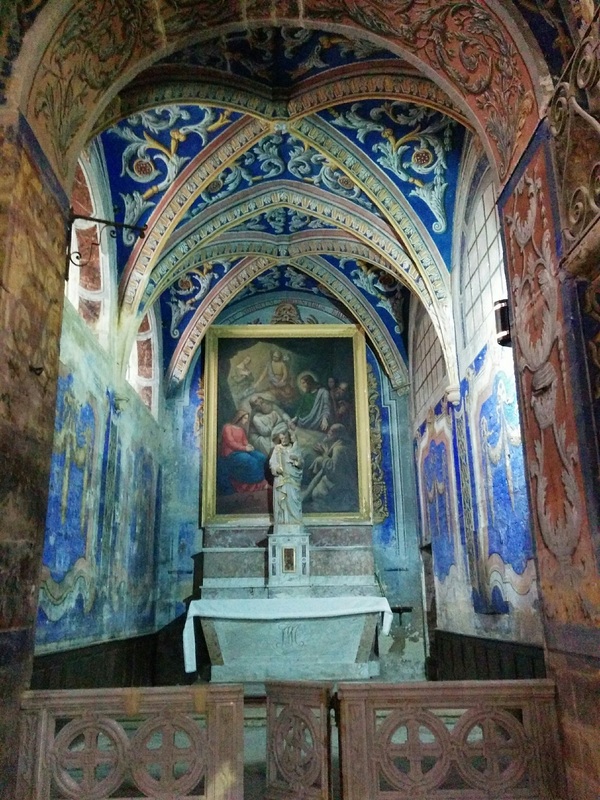 It was like a treasure hunt, each tower, ruin, church, bridge or fort a prize. We learned about Pope John XXII, who was born and raised in Cahors, the son of a shoemaker. We rode past the fountain of the Chartreux, which was a sacred spring in Celtic times, before the Romans arrived in 50 BC. The Roman amphitheatre was hidden in an underground parking garage, which made finding it problematic. I learned later that it wasn’t discovered until the city dug under Place Gambetta to build the parking garage, which opened in 2009. 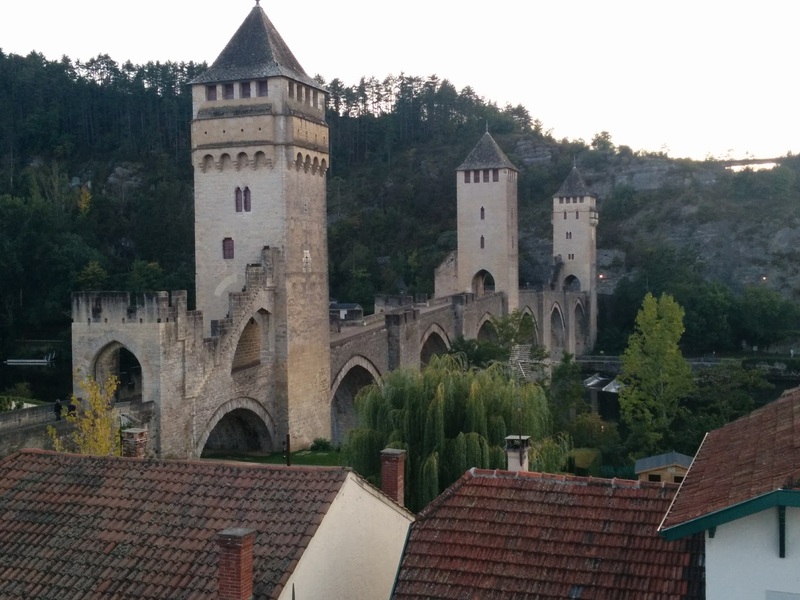 The end of the tour was the fortified Valentré Bridge, which we could also see from the hostel. Monday morning, we continued down the Lot River, often getting separated as Cheryl took a more challenging route. 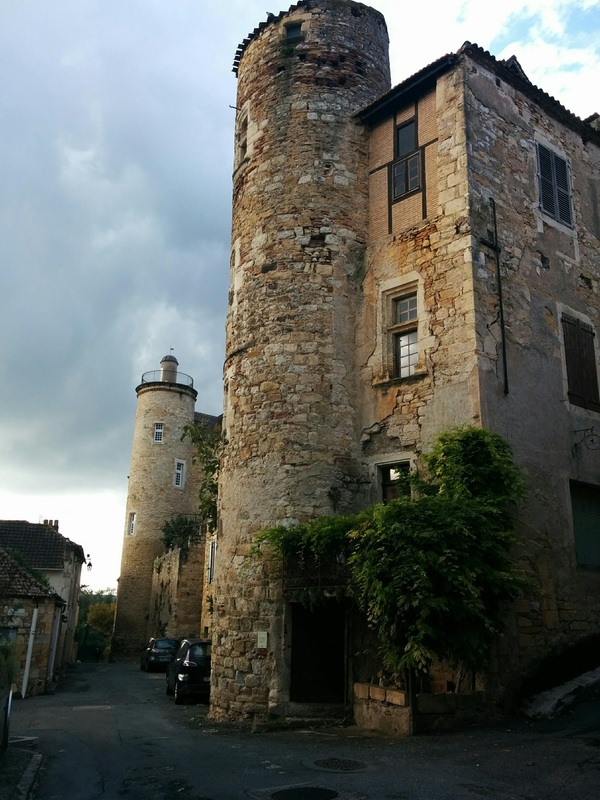 When I arrived in Puy l’Eveque, I went straight to the Maison Delmas, a former mill dating back to 1769. An English couple run it now, and it is a labour of love. While I was checking in, Cheryl called. She had gone to the top of the town and was having lunch. I pushed my bike up through the cobbled, steep streets to join her, and convinced the owner of the lunch place to serve me whatever was left. That was a major concession on her part, my having arrived just at 1400. After lunch, Cheryl and I rode back down the hill, moved in, then walked around the lower part of town. Rain was threatening, so it was time to plan another escape. The next day we only rode 19 km, to the train station at Monsempron, finishing our ride down the valley of the Lot. 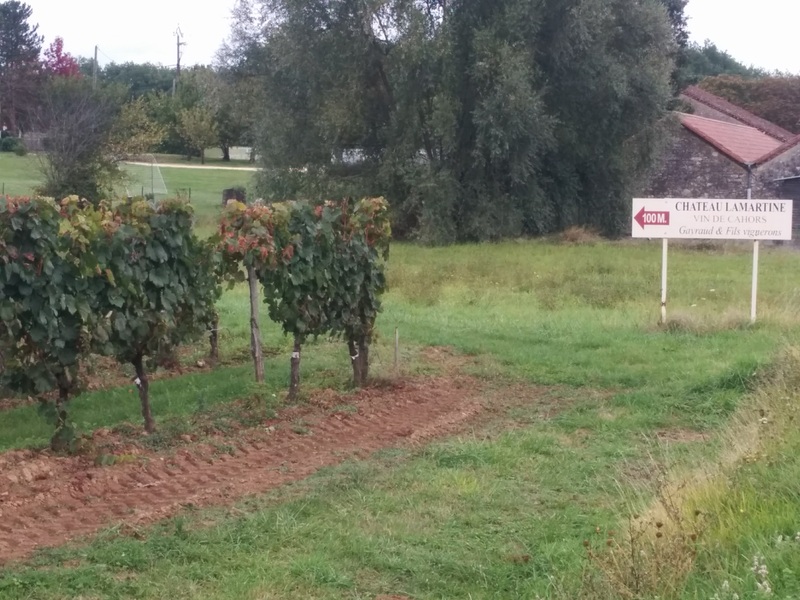 As the clouds gathered, we passed vineyards of the black Malbec wine that made Cahors famous, including La Martine, a wine that we had enjoyed in Cahors itself. At Monsempron, we took a train through the rain to Agen and then to Nîmes. By the time we arrived, the sun had come back. 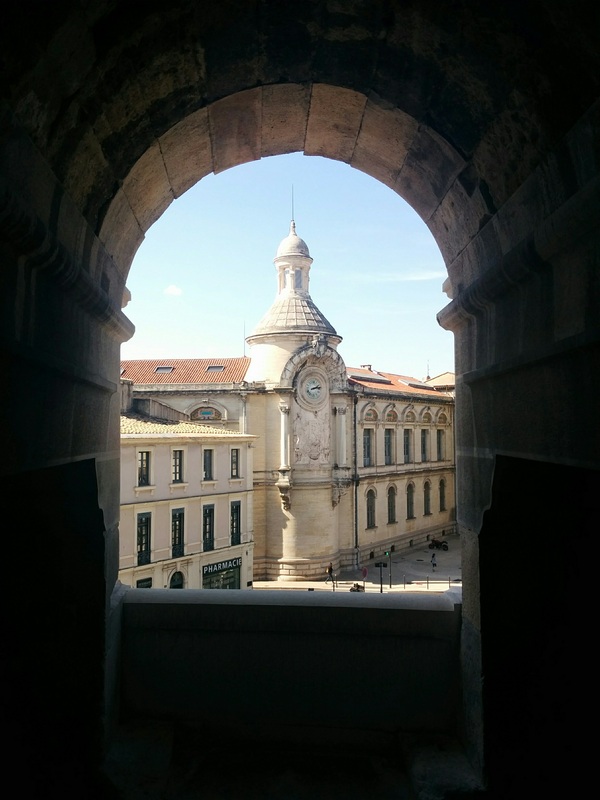 We checked into the Hotel Marquis de la Baume, then walked around the historic center, settling on an excellent restaurant just behind our hotel. The next day, the good weather continued, sunny and pleasant. 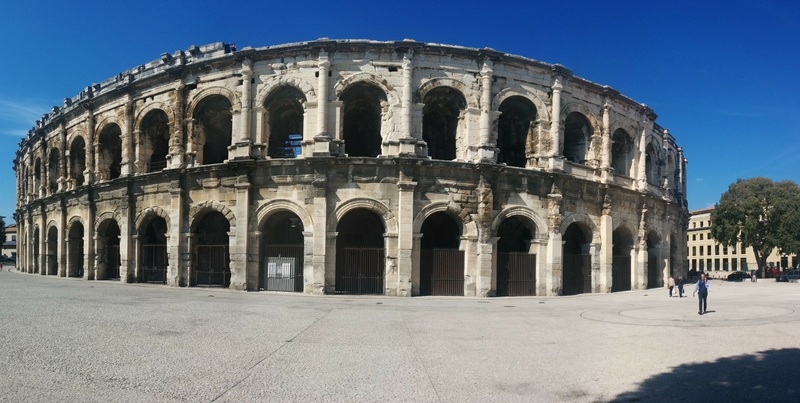 Nîmes is an ancient city, with Neolithic settlements under Celtic, Gallo-Roman, Visigoth, Frankish, Huguenot, French and modern cities. The impressive arena, third largest Roman amphitheatre in Europe, was saved from destruction because the defenders holed up there when the Visigoths arrived, and the new conquerors settled into it as a fortress. Until the 19th Century, it was a neighbourhood in the city. Clearing it out to restore the great monument was no small affair, considering the displacement involved. The Celtic leaders who lived in Narbonensis were smart enough to side with Julius Caesar, and they spent 15 years fighting with the Romans in northern Gaul and Egypt, which entitled them to citizenship, and plots of land back home after the campaigns. Thus was born the Gallo-Roman society, which thrived for another 300 years or so. Without a doubt, this was one of the more interesting cities we visited, just because of its history: https://en.wikipedia.org/wiki/N%C3%AEmes. At the top of the Tour Magne, I did my convincing impression of being local by explaining to a group of American tourists what they were looking at in the distance. I slipped away before we could engage in deeper conversation. In the evening, Cheryl and I went to the movies: an art film festival with more wonderful screenings than we could take in. We saw three films and compared notes on the last two afterwards. 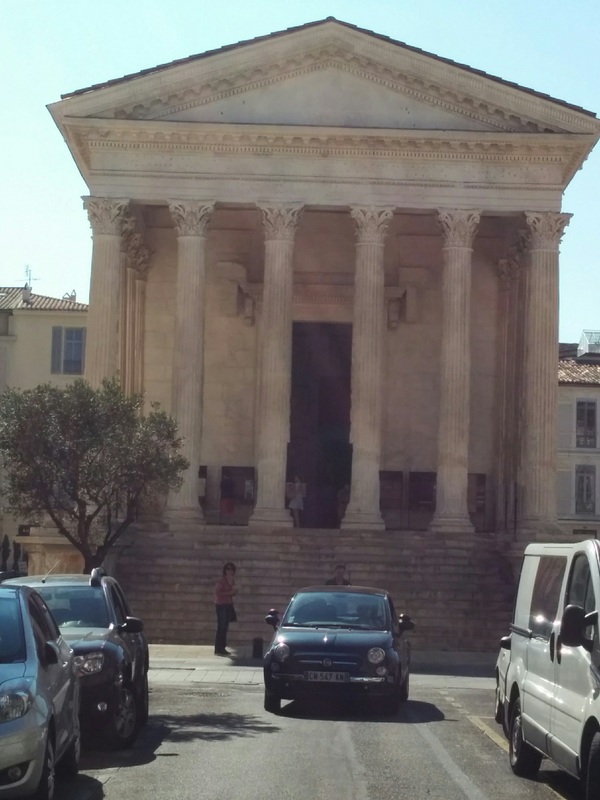 Thursday was our last day in the Gard Department, the day that we would reach the Rhône River and the region of Provence, now the larger region of Provence-Alpes-Maritimes-Côte d’Azur, or PACA. We climbed out of the city toward Uzès, only to find that the road through the military training area was closed. 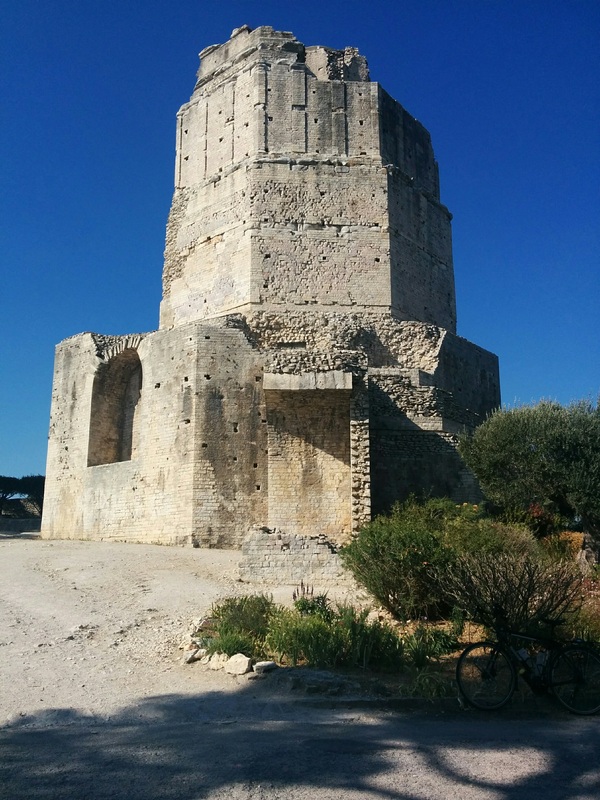 The detour took us almost all the way to the eastern end of Nîmes, which made me grind my teeth, because we could have simply gone that way in the first place, had we known. The pine woods surrounding the live-fire bombing range provided a rural, scenic ride, but I kept thinking of how serious the warning signs on the barbed wire fence were (Danger de mort!). This was where the French Foreign Legion learned how to blow up things; I would not want to stray onto that base by mistake. 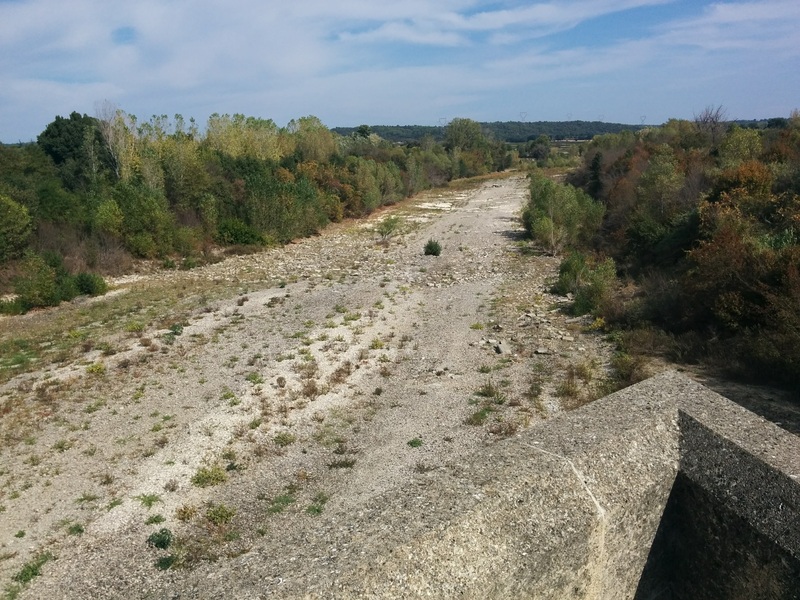 On the way, I saw dramatic evidence of the drought that only broke when we arrived in Southern France: the Gardon River completely dried up. In Uzès, I found a bike shop, which had one-litre bicycle bottles and a new mirror. I also pumped up my tyres. 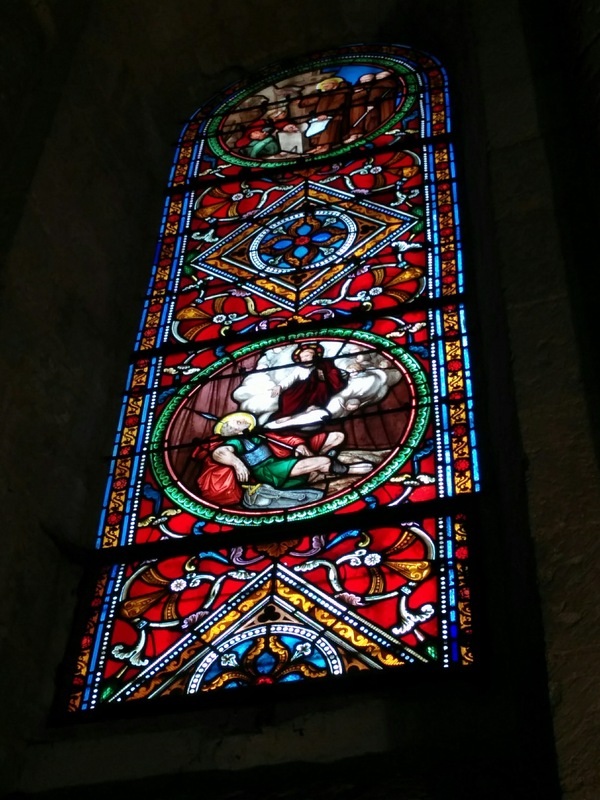 Uzès had a church with beautiful art. 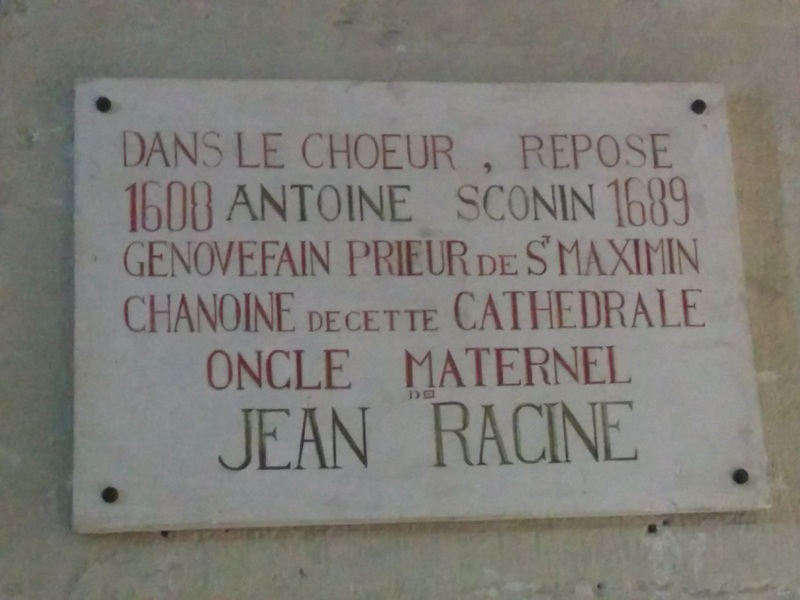 The Choir holds the tomb of Jean Racine’s maternal uncle. Anyone who has sung or heard the Cantique de Jean Racine will recognize the name. From Uzès the road was almost all downhill, until we reached the Pont-de-Gard, a striking example of Roman engineering. 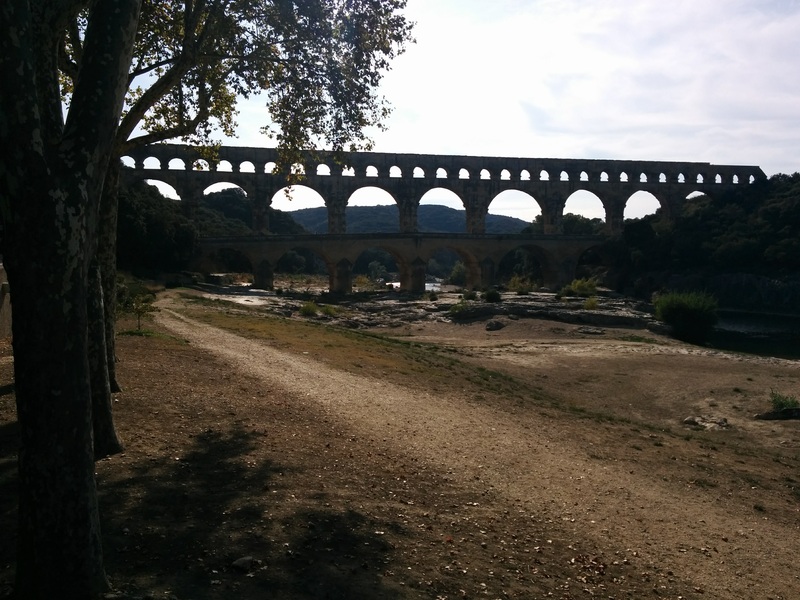 It is not a bridge, but a three-tier aqueduct, the largest Roman aqueduct in Europe. It carried water 50 km from a spring in Uzès to Nîmes. One of the best-preserved aqueducts, it is also a World Heritage Site. We made our way across it, then down to the Rhône River. Cheryl and I were separated all day. She rode ahead of me, texting back warnings of annoying security guards and exceptional sights. 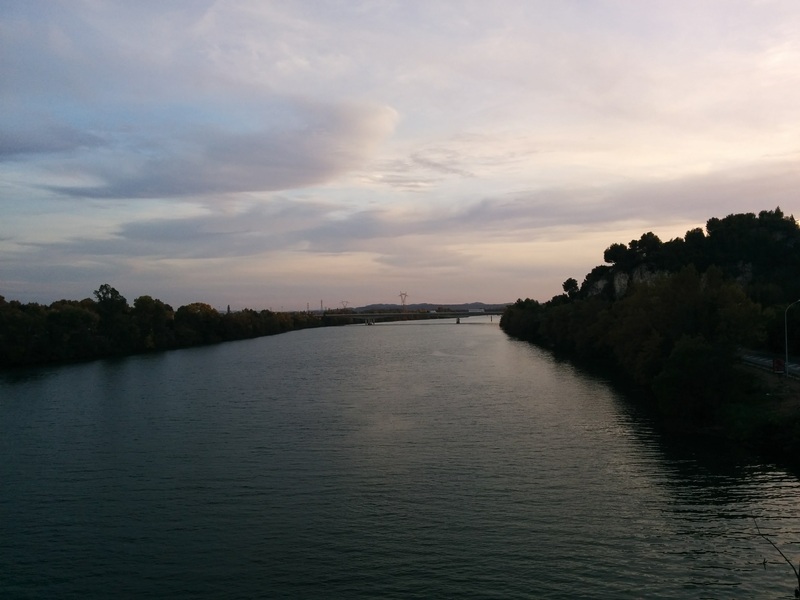 Somehow, I got ahead when we reached the Rhône River, where the bike route varied between outstanding and non-existent. Making my way upstream, I realized more directly how the Eurovelo 17, the Route du Rhône, which I had planned to ride when originally laying out River Run 2017, would not have been much fun in France. After the Swiss border, much of it goes through industrial suburbs and often disappears, putting the cyclist on either dirt track or busy highway. There is a reason that the Rhône Valley is such an economic engine; I am glad that we rode the Pyrénées instead. By evening, we were in Avignon, fabled city of the Popes (and anti-popes, depending on your politics at the time). We got a room in the Hotel Danieli, clearly named for the eponymous establishment in Venice, but nowhere near as luxurious. I particularly did not enjoy the labyrinthine series of stairs needed to reach our room. We had reached the last region on our trip, a land of mountains and beaches, gorges and rivers, cosmopolitan cities and remote villages. I was excited to be here, and looking forward to the places we would visit. This entry was posted in bicycling, River Run 2017 and tagged Bergerac, Beynac, bicycle rides, bicycle touring, Bordeaux, Cahors, Caudoin, Dordogne, Figeac, FUAJ, Garonne, HI Hostelling, Lot, Montbazillac, Nimes, Orange, Pont du Gard, Rhone River, Rocamadour, Saint-Emilion, Souillac, Travelogue, Uzes by JT Hine. Bookmark the permalink. Thank you. More coming soon!